Children’s Dentistry is a specialty office dedicated to providing oral health care to children of all ages. Our office is designed especially for children. We offer state of the art treatment in a comfortable and friendly environment so that children may have positive dental experiences. Our office also provides comprehensive Orthodontic care. Our goal is to empower children and adolescents to achieve and maintain beautiful and healthy smiles throughout their lives. Our Doctors along with our staff are trained and equipped with many methods of behavior management and modification. Our Doctors have spent their entire dental career focusing on the dental needs of children. Both Dr. Saeedi and Dr. Trina are graduates of Temple University School of Dentistry. They possess a passion for dentistry and have total commitment to providing your kids, teens and adolescents with the best possible dental experience available. The staff of Children’s Dentistry is comprised of dental professionals who are dedicated and trained in many methods to help make children feel comfortable. They are highly skilled and certified in CPR, sealant application, coronal polishing and radiation safety. Our experienced and well trained staff truly works to make a child’s visit to the dentist a pleasant and comfortable experience. Sepehr A. Saeedi, D.M.D.- From a young age, Dr. Sepehr Aaron Saeedi knew his passion and talent: dentistry. His father, a dentist, inspired and guided him to become one of the most caring, dedicated and dexterous advanced oral health care providers. Educated in one of London’s top schools, he went on to complete his undergraduate studies at Mount Sac. As one of the youngest students to enter Temple University Dental School, Dr. Saeedi received his Doctor Of Dental Medicine degree and completed a fellowship focusing on the Pediatric population. He was on staff at Greater El- Monte hospital and worked with Children’s Dentistry of Montebello to provide dentistry and oral care for hundreds of children under general anesthesia. 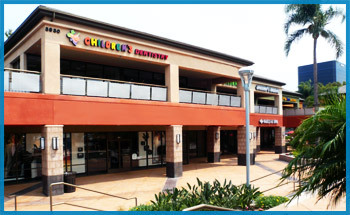 An active member of the American Dental Association, the California Dental Association, and the Orange County Dental Society, Dr. Saeedi founded his own office, Children’s Dentistry and has been providing oral health care to children and adults since 1993. Among his many accolades and accomplishments is that he has been honored as one of Orange County’s Top Dentist since 2000. Committed to preventive care and oral health, Dr. Saeedi helps to prepare many undergraduate students for dental school, as well as prepare them for private and general practice. An advocate for children, he donates alot of his time each year to help underprivileged kids and strives to provide the highest quality dentistry to all of his patients. Trina L. Melancon, D.M.D. – Dr. Trina has a passion for children and is polarized towards the growth, development, and the active education of each and every child. She strives on motivating and encouraging kids to be the best that they can be. She is an inspirational role model who is actively involved with children at every level. She currently visits schools and volunteers teaching oral health along with art. She is a member of the Parent Service Auxillary at Our Lady Queen of Angels in Newport Beach. Dr. Trina received her specialty training from Columbia University and was chosen to deliver the postgraduate speech on behalf of all the residents. She has been honored as a top Dentist of Orange County since 2009 and is an active member of American Academy of Pediatric Dentistry, California Society of Pediatric Dentistry, American Dental Association, and the California Dental Association. Dr. Trina continually attends advanced courses to continue her mission of developing knowledgeable positive patients who embrace preventative dental care, good oral hygiene, and healthy diets. Her hobbies are dancing, singing and interior designing. Sergio L. Ferreira, D.M.D. – Dr. Ferreira specializes in Orthodontic Care and received his Orthodontic training at Columbia University. He joins us with many years of experience in both academia and private practice. He brings with him the philosophy of our office and dedication to providing the highest quality of oral care to patients of all ages. Dr. Ferreira completed his orthodontic training at Columbia University along with a fellowship in cranial facial deformities. He was very active while at Columbia University serving as Class president and receiving multiple awards for presentations of clinical cases. He also received a Clinical case presentation award at the 2007 American Journal of Orthodontists. He has had multiple publications in the American Journal of Orthodontics and continues to be involved with research in Brazil. His philosophy accentuates the importance of education and research as the key to remaining at the forefront of the profession. Dr. Ferreira has had the unique experience of being involved in General Dentistry, Pediatric Dentistry and Orthodontics. He is an active member of the American Association of Orthodontists, The Pacific Coast Society of Orthodontists, The American Dental Association and The California Dental Association.